By default, when a message has finished displaying all of the words and is waiting for player input, a little animated cursor is shown to indicate that the player should press the confirm button to proceed. However, this cursor is stored inside the windowskin, which gives you enough freedom to have one 24×24 cursor with 4 frames of animation. You also cannot choose where the cursor should appear, or how fast it should animate. 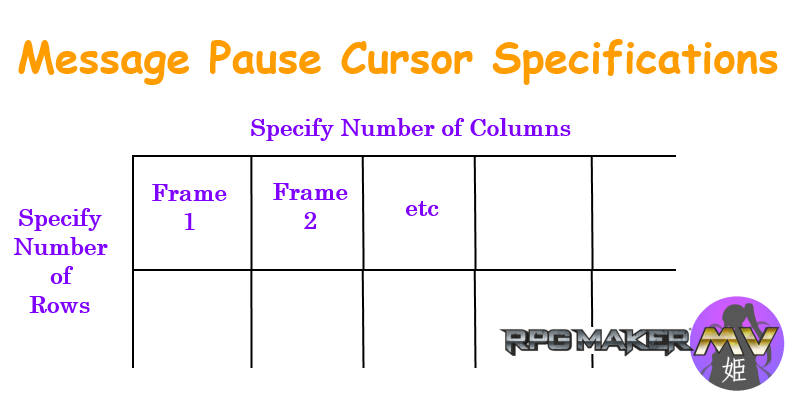 With this plugin, you are given more control over that pause cursor. You can change how it looks! You can change where it’s positioned! You can change how fast it animates! What kind of cursor will you create? Download ths plugin and place it in the “plugins” folder in your project’s “js” folder. Then open your Plugin Manager (F10), double-click an empty row, and select the HIME_MessagePauseCursor plugin. Create an image called “MessagePauseCursor” and save it in the img/system folder of your project. This image is broken down into a grid. Each row represents a single cursor. Each column represents an animation frame for that cursor. Each frame can be of any width or height, but all frames must have the same width and height. You can have any number of frames per cursor, but all cursors must have the same number of frames. Once you have set up your pause cursor image, go to the plugin manager and for this plugin “Hime_MessagePauseCursor”, specify how many rows there are and how many frames there are in each row. Here is an example that I have prepared for you to use. Where the SPEED is a number between 1 and probably 24. The higher the number, the faster it is. You can experiment with each number to see how fast they are. Any idea? The game doe sload, but the cursor does not work, and I see this message displayed on console. Doesn’t work at all. not on new project or old project. Seems par for the cource with this guys plugins. They sound cool but never really work right. Your plugin isn’t working for some reason. I’ve tested it in a fresh project and no message pause cursor/animation is showing up on messages. Nevermind that, I missed the part where it was an extension of your message system. Can you please clarify that? I have an old project where this plugin is working perfectly. When trying to do it again in a brand new one, absolutely no cursor shows up no matter what I do. I have the settings and image exactly the same as my old working project, but it just doesn’t want to work in the new one. Is there some extra message plugin we need to download to make it work now? I don’t see any mention of that in the video or on this page. Tried both v1.1 (the one in my working, old project) and v1.2 from this site, and neither work in the new project. I recently updated my RPG Maker to v1.3.3 so I don’t know if that’s causing the conflict? Sorry for the late response. I didn’t actually try that. It just didn’t work for me and when I came to re-read the thread I saw he had a message system plugion and figured that’s why it wasn’t working. how are you specifying the pause cursor? Are you planning on releasing the Message box over Events plugin? That reminds me of the comic style feature from Ccoa’s message system from RMXP. I loved that feature and miss it greatly. It also made the box fit the words. It made the game look slimmer. I really can’t stand the message box as it is by default. It’s so bulky. I have a copy of Ccoa’s Message System Script from RMXP if you want to peruse it for idea’s or inspiration. Yes. However, I’m currently implementing some core functionality for my message system, which may change the way the other message plugins are written, so I’m holding on to them for now.